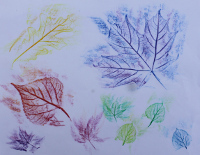 Leaf rubbings are a fun and creative way for young ones to play with nature and colour. For adults that are still young at heart, it’s a great excuse to join in and have fun with a young friend! 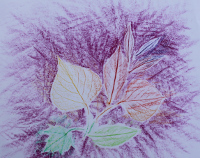 Take a leaf and place its top side face down on a piece of paper, so its veins on the underside are facing up. The bumpy veins will help make the pattern show more prominently. 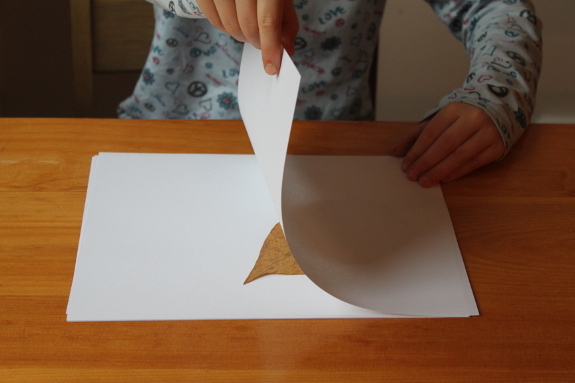 Place another piece of paper over the leaf. 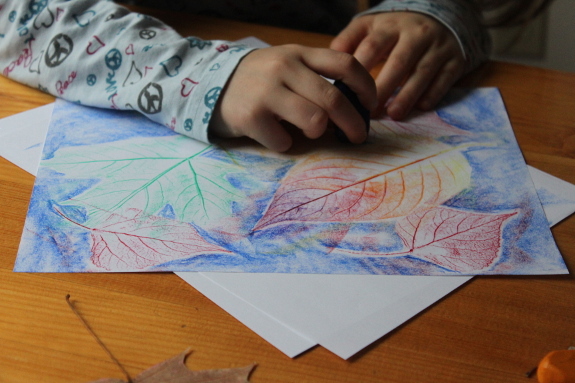 Keep your paper and leaf still with one hand pressing down lightly while the other gently rubs colour over the leaf. 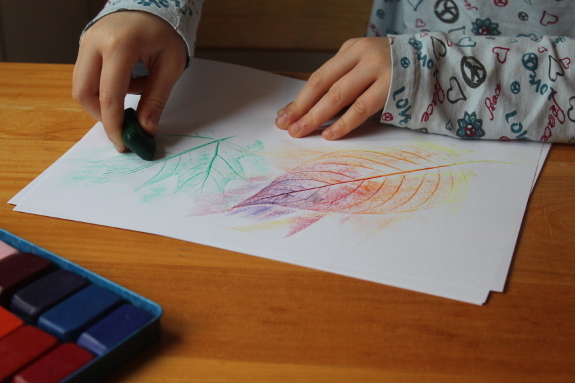 Experiment with back and forth motions versus brush strokes where you sweep the crayon away from you and lift up and then come down and stroke away from you in another spot. Cover the entire leaf including edges. You may wish to use the long side of the crayon (if there is paper along the crayon, you’ll need to peel that off). This will get the picture done with fewer strokes and a smooth look, but a fine tip will work well, too, especially if you can keep the strokes fairly close together. 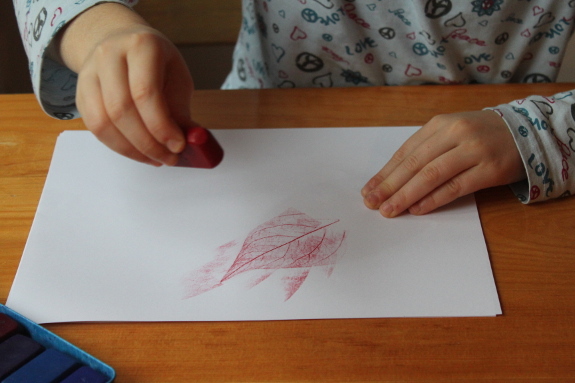 Remove your leaf and place another between your paper. 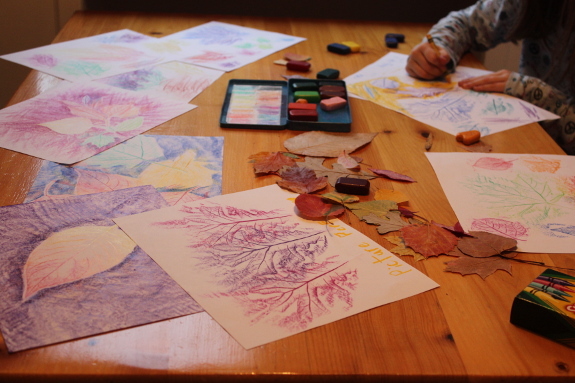 You can use the same colour for all the leaves or change colours for each different leaf. 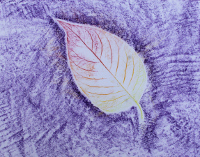 You can even use different colours on the same leaf – let your imagination run free! 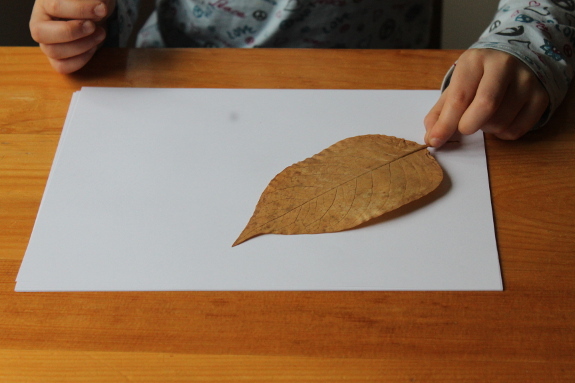 Don’t worry if your leaf moves a bit – the extra lines can have a neat effect! For those of you with the interest and patience, give your picture a coloured background.